In the world of Munnabhai MBBS, taporis have a conscience, a golden heart and a healing touch. 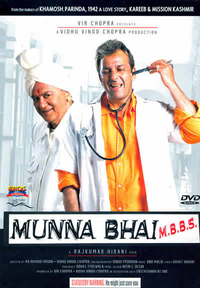 The tagline of Munna Bhai MBBS reads: He might just cure you. And he does. Without resorting to tired-and-tested gimmicks. He will teach you to love stronger and laugh harder!Be prepared for a laugh riot as you enter the theater and you will come out crying out of laughter and emotion.